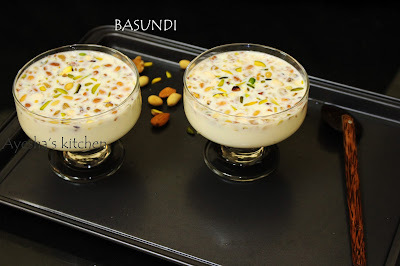 Basundi, an Indian sweet which is rich, creamy, flavored with saffron and nuts. It is the popular and common dessert in Gujarat, Maharashtra and Karnataka. Basundi is made with ingredients which is easily found in every ones kitchen. 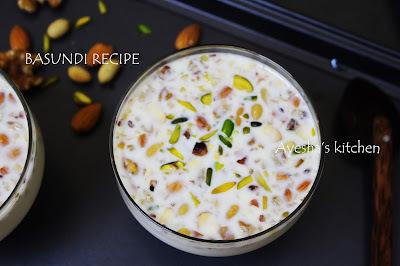 It is the sweetened and thickened milk with chopped nuts, flavored with cardamom and nuts. A very easy, rich dessert with cream and nuts. This is prepared generally during festivals like Holi, Diwali. 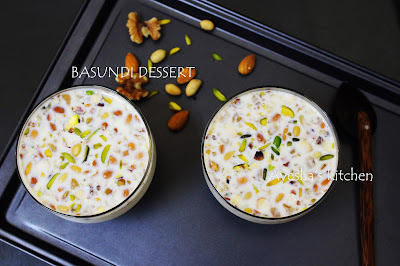 Rabri / Rabdi, is a dessert of North India which is very similar to Basundi dessert. Traditionally Basundi is served with hot poori. If serving with Puri, then it is recommended to serve warm Basundi and Poori. And if you prefer to serve as a dessert , then chill it before serving. Basundi will thicken on cooling. 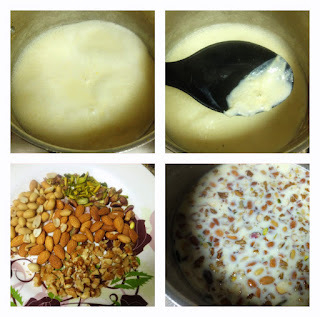 So lets see how to make this yummy Indian dessert and do not forget to try this recipe. Its really an inviting dessert. You can add the nuts according to your preference. Boil milk, condensed milk, sugar in a heavy bottomed vessel on high flame. Once it boils, reduce the flame to low and simmer it for 8 minutes. Keep on stirring in each 2 minutes interval. After few minutes of simmering, you can see a crust on the top formed and fold in the crust into the milk mix and cook until it thickens. Do not forget to stir in each intervals. Basundi will be thick, yet a runny consistency. When done, add the cardamom powder and remove from flame. Now add the chopped nuts and mix well. Chill it for few hours and serve cold in a bowl. Garnish with some sliced pistachios and saffron strands. NOTE: I skipped adding saffron because i do not have any left here. The amount of adding nuts depends upon your taste and preference. You can also serve Basundi warm with puri. Basundi will thicken on cooling.